Check out the cover Linda Wisdom has for her next Hex novel. 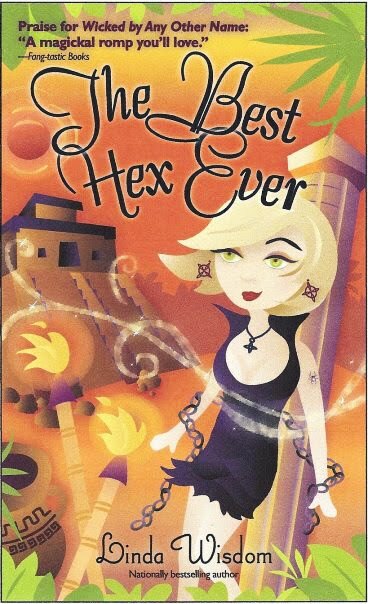 This is a great series and I can’t wait for the fifth novel, The Best Hex Ever, to come out. Thank you Book Chick City for showing me we’re getting closer to its release date of October 5, 2010. Subterranean Press has announced that two new novellas were turned in. One of which happens to be called Counterfeit Magic and happens to be a brand new story by Kelley Armstrong. We can rejoice in knowing that Counterfeit Magic will be longer than Angelic and will feature the same characters from Dime Story Magic and Industrial Magic. Shiloh Walker has added a new snippet from her upcoming novel, Broken, which releases March 2nd. For What It’s Worth has their latest auction up and this time there are four books you can get your hands on: Deep Kiss of Winter by Kresley Cole & Gena Showalter, Wicked Game and Bad to the Bone by Jeri Smith-Ready and Eternal Hunter by Cynthia Eden. The auction ends February 21st. Remember, all proceeds go to Doctors Without Borders. Kim Harrison has posted a few more sketches from the upcoming Hollows graphic novel. Newsarama.com has an interesting article on the popularity of the young adult genre being optioned for film. Within the article, they mention quite a few books that have already been purposed that I wasn’t even aware of, namely Uglies by Scott Westerfeld and Cassandra Clare’s The Mortal Instruments series. For fans of Katie MacAlister, you’ll be happy to note that the first ever KatieCon is officially going to happen. It will happen in Arlington, Washington (just north of Seattle) and will be June 25-26th. There are a limited number of registration spots open, only 50, so if you’re interested in going, make sure you go over and register asap. 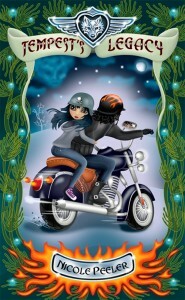 I know it’s already making the rounds, but I am loving the covers Nicole Peeler has for her Jane True series. So I had to post it when I saw that Tempest’s Legacy (January 2011) was up over on Orbit’s blog. If you’re interested, Orbit also has the blurb. The latest Fifty-Two Stories article is up and this week we have – French Artist Killed in Sunday’s Earthquake by Simon Van Booy. SciFi Wire tells us that Bryce Dallas Howard as Victoria in Eclipse has been revealed….what do you guys think? 1st thought: she’s definitely not Rachelle. Her face just looks too soft. It’s also not the greatest picture, so maybe it’s just the shot. We’ll have to wait and see for more images. Check out what Diana Pharaoh Francis has posted. It’s the blurb for the next Harrowgate novel, Crimson Wind, which follows Bitter Night. This is a great new series and one I can’t wait to see. This was just one of the many things I discovered in SciFi Guy’s current Weekend Report. Max is a Shadowblade—a supernatural warrior created to serve and protect her witch, Giselle. She was made to kill and she’s very good at it. But there are some troubles you can’t solve with a gun and Max has run smack into one. Since the devastation of her covenstead four weeks ago and the revelation of the coming apocalypse, Max has been itching to bring her family back to the safety of Horngate. The only trouble is they think she was murdered thirty years ago, a belief Max has done everything in her power to cultivate. So she’s naturally a little worried about how they’ll feel when she tells them she’s alive and never bothered to get in touch. And oh by the way, mom and dad, she isn’t human anymore. As if that wasn’t enough to worry about, the Guardians have made a major move in their war against humanity and now it’s a race to save her family before they are swallowed by a a blood storm of wild magic. That is, if Max can even get off the starting block. First she has to deal with an enraged wannabe lover who can destroy worlds, a pissed off mage, and a pig-headed witch. Jill Myles is giving away a few copies of her novel, Gentlemen Prefer Succubi. Contest ends Feb. 18th. All Things Urban Fantasy has her weekly posts on the tons of giveaways going on right now. Gena Showalter is giving away a copy of Nalini Singh’s Angels’ Blood. Contest ends tonight. SciFi Guy is giving away two copies of Kim Harrison’s Black Magic Sanction. Contest ends March 1st. Rachel Vincent is giving away two copies of Shift. Contest ends soon (I guessing).